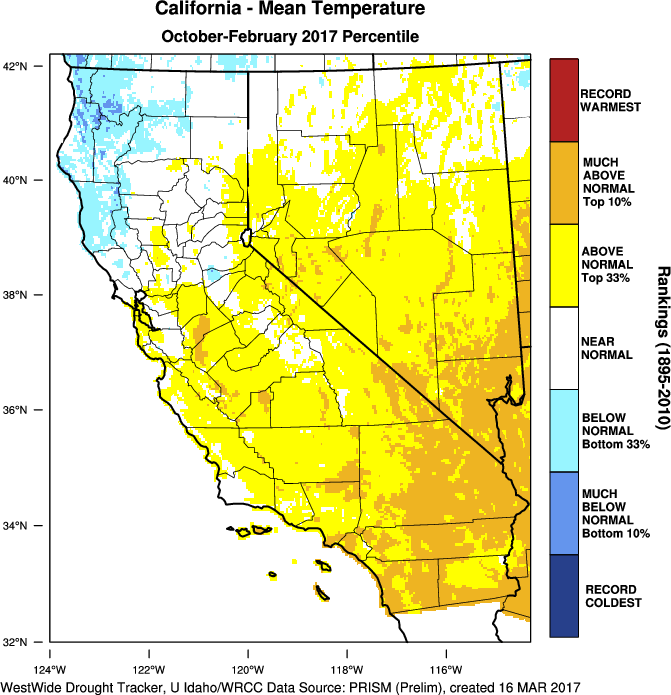 2016-2017 turned out to be quite the winter across California (especially in the northern half of the state). 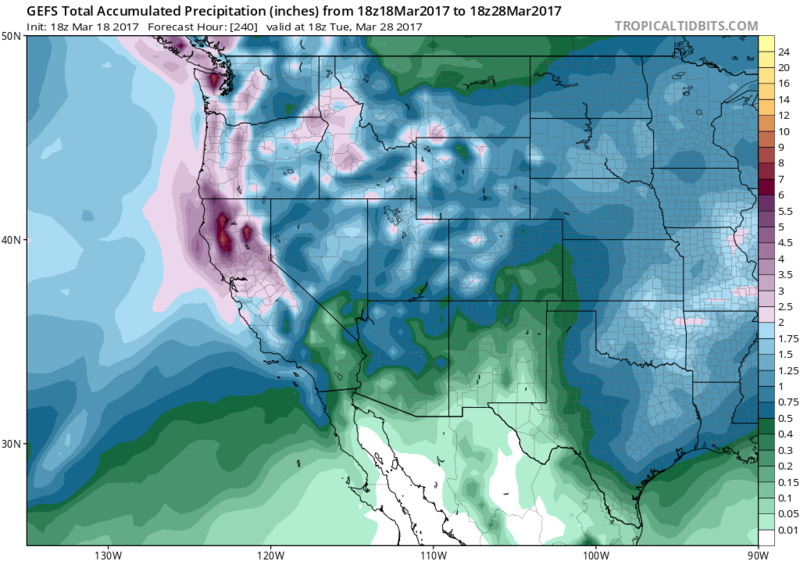 A relentless series of storms–driven by persistent troughing and an associated active jet stream along the West Coast–brought numerous atmospheric rivers and associated heavy precipitation to much of the state since November. Notably, there was in fact a broad and highly persistent downstream ridge centered over the Aleutian Islands for much of the winter. This conspicuous feature does bear some resemblance to the Ridiculously Resilient Ridge which plagued California in recent drought years, though clearly its position this winter was far enough west to have vastly different effects in the Golden State. I will eventually have a more comprehensive post focused on the possible causes of California’s reversal in fortune this year, along with some thoughts regarding why such an anomalously wet winter was essentially unanticipated. Interestingly, none of the individual storms so far this season have been particularly destructive by California’s historical standards. Instead, most of the widespread flooding, mudslides, and other infrastructure disruptions that have occurred stemmed primarily from the cumulative effect of unusually frequent moderate to strong storm events. It has been previously noted that California’s most dangerous flood events do not necessarily occur during California’s wettest winters, although it’s not totally clear whether that’s just a matter of historical luck. What is pretty clear, though, is that this year’s extreme wetness on the seasonal scale has pushed parts of California’s aging water infrastructure to the brink–and had even a single additional warm, wet atmospheric river come ashore during the peak of winter, the overall flood situation might have been considerably more serious. Fortunately, most of California did receive a substantial break from the wet weather over the past couple of weeks, with mostly dry and warm conditions nearly statewide so far in March. That dry pattern, however, is rapidly coming to an end (as I discuss further below). Now that we’re more than 2/3 of the way through California’s wet season, it’s pretty clear that much of the state has experienced its wettest 3-6 month period on record. Virtually every corner of the state is above average to date, though anomalies have been much more impressive in the north. 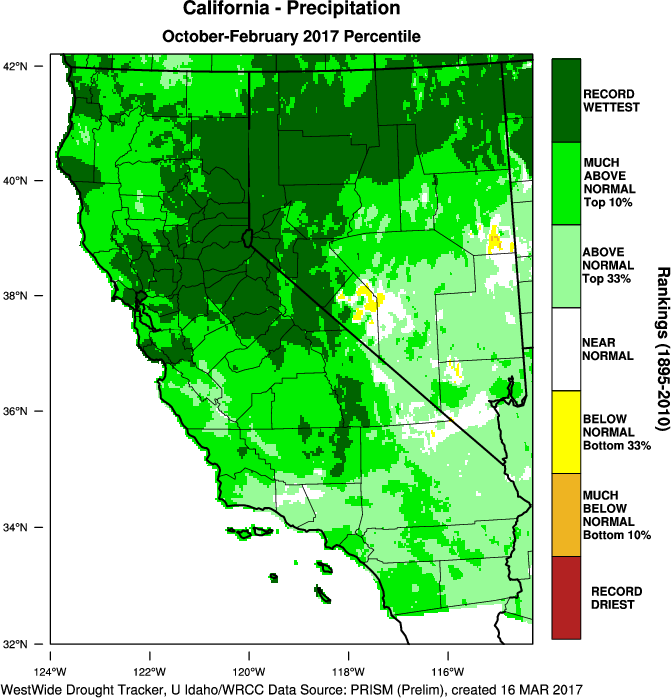 The Northern Sierra watersheds are currently sitting at just above 200% of average precipitation for the season to date–a rather extraordinary statistic. 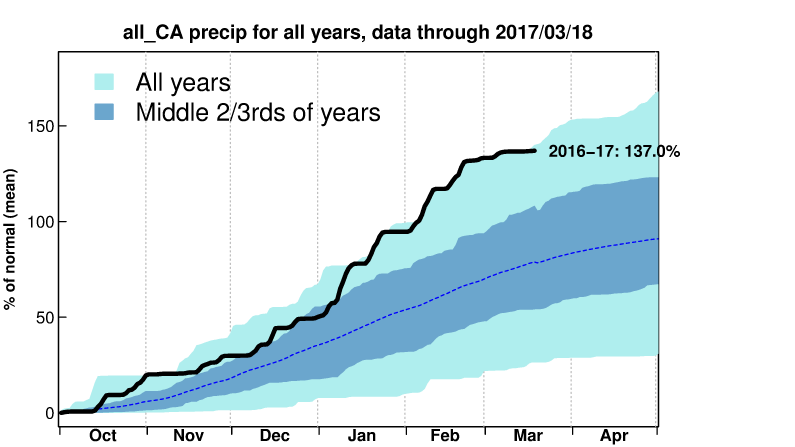 If California receives at least average precipitation for the rest of the season, 2016-2017 would become the state’s wettest Water Year on record. Snowpack in California’s mountains is also well above average and the highest since the very wet/snowy winter of 2010-2011. What is striking, however, is how much Sierra snow water equivalent has lagged overall precipitation. For example, Northern Sierra snow water equivalent is currently 145% of average (vs 202% of average for overall precipitation). This effect has been particularly pronounced at middle-elevation regions where wintertime temperatures are more “marginal” for frozen precipitation than at colder, higher elevations. While this winter has certainly been colder than recent (record warm) ones, conditions have still been near to above average across most of the state–and more importantly, have been considerably warmer than during most of California’s historically wet winters. California’s temporary reprieve from wet conditions is rapidly coming to a close. A series of storms will bring renewed precipitation to most of the state over the next few days, and accumulations could be pretty impressive for mid-March. Northern California is expected to receive the lion’s share of precipitation from this series of storms, but Southern California will definitely still see some rainfall (and perhaps some heavier stuff, depending on how the details work out). Several of these storms will have a respectable moisture tap, and heavy precipitation may occur in the same orographically favored areas that have already seen a tremendous amount of rain this winter. While none of these storms looks especially strong at the moment, soils are still saturated and rivers running high across the northern half of the state. Thus, there will probably be some renewed flooding concerns at some point over the next 10 days, especially since any rainfall will combine with the early snowmelt pulse that has already begun this year. Also, since these storms will be relatively slow moving and will likely contain substantial moisture, there is the potential for precipitation accumulations to end up somewhat higher than are currently anticipated. The upcoming storms will also be associated with cold air aloft during at least a portion of the event, and with the increasingly strong March sun angle atmospheric instability will be elevated across much of the state. Thus, occasional thunderstorms are a good bet across favored areas (especially the Central Valley and perhaps parts of the South Coast). Some locally strong to severe thunderstorms will probably occur at some point over the next 10 days in the Central Valley (as often happens in March), but pinpointing the most active days is difficult at the moment. Needless to say…an active late winter/early spring weather pattern will likely be in place for at least the next 10-12 days, and perhaps beyond.